Nick Schmaltz is an American professional Ice-hockey player who plays in the National Hockey League (NHL). As of 2018, Nick Schmaltz currently plays for the Arizona Coyotes as their Center. Nick Schmaltz previously played for Chicago Blackhawks. Nick Schmaltz reportedly earns around $595,308 as his yearly salary from Arizona Coyotes. Further, he has an estimated net worth of over $1.5 million in 2019. Schmaltz is in a romantic relationship with his girlfriend, Abby Ludwig. As of 2019, Nick Schmaltz has an estimated net worth of over $1.5 million and earns $329,692 as his yearly salary. He reportedly signed a 3 year / $4,625,000 contract, including a $277,500 signing bonus, $4,625,000 guaranteed with Arizona Coyotes in 2018. Further, the NHL player has an average salary of $4,625,000 annually while Derek Stepan is among the highest earner of the team with an annual salary of $6,000,000. Additionally, Nick Schmaltz so far has made earnings of $3,700,000 from his entire NHL career. As per his relationship status, reportedly, he is not married. However, he is in a romantic relationship with his girlfriend, Abby Ludwig. The couple attended the same high school and has been dating each other since 2011. Schmaltz has posted a lot of pictures with his girlfriend, enjoying a vacation together. So, this suggests that the couple is living a happy life and additionally, there aren't any rumors of the couple getting split in recent time. Despite being in a relationship for long, the couple hasn't disclosed about the probable date of their engagement and wedding in the media yet. Talking about his body measurement, the Famous NHL star is 6 ft 0 in (183 cm) in height and weighs around 176 lb (80 kg; 12 st 8 lb). Nick Schmaltz was born on February 23, 1996 (age 22), in Madison, Wisconsin, the U.S. to parents Mike Schmaltz and Lisa Schmaltz. As per his nationality, he is American and belongs to the White ethnic group. Further, his star sign is Pisces. His brother Jordan Schmaltz plays professional ice hockey for the San Antonio Rampage of the American Hockey League (AHL). Nick also has a younger sister, Kylie, playing volleyball at Kentucky University and a younger brother, Jake, playing for Team Wisconsin u16. Further, the father and uncles of Schmaltz, Marc, and Monte, played football at North Dakota University. In the first round (20th overall) of the 2014 NHL Entry Draft, the Chicago Blackhawks selected Schmaltz. Schmaltz made his NHL debut in the opener of the season against the St. Louis Blues on October 12, 2016. On October 15, he scored his first NHL goal against the Nashville Predators' goaltender Marek Mazanec. 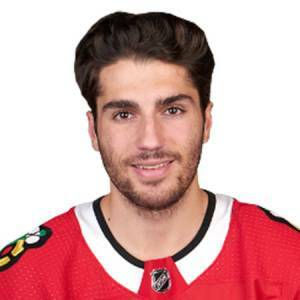 In the 2018-19 season, in exchange for Brendan Perlini and Dylan Strome, Schmaltz was traded by the Blackhawks to the Arizona Coyotes on 25 November 2018. In Januar 2019, Schmaltz was sidelined with what the Coyotes described as a major lower-body injury for the rest of the 2018- 19 NHL season. In the 2013 World Junior A Challenge with the U.S. men's national ice hockey team, Schmaltz was named the most valuable player in the tournament as he led Team USA to capture the gold medal. Currently, he is playing under the manager Rick Tocchet along with his star team-mates such as Alex Goligoski, Alex Galchenyuk and many more.